2. What time did you get up this morning? Too early! I rarely wake up on my own. I try to get up by 6:30...6:45 at the latest. 3. What was the last film you saw? The Invention of Lying with Ricky Gervais and Jennifer Garner. I had been wanting to see it since it came out at the movies...of course, I waited until it came out at Redbox :o) It was pretty good. 5. What is your favorite TV show? I have several...The Office, Seinfeld, Grey's Anatomy, 30 Rock, Ground Breakers and last but definitely not least...LOST!!! 8. What food do you dislike? I dislike meat and eggs...haven't eaten either one in almost 20 years! 9. What is your favorite CD at the moment? I have a "mixed tape" cd of songs I downloaded off Napster that I love listening to in the car....not that I EVER get to listen to my music :o) There is several songs by Chris Tomlin, Toby Mac, Beyonce', Casting Crowns and Steven Curtis Chapman. 10. What did you do tonight? Had supper with my sweet family, made Jonah a new bib and watched The Office. 12. Anywhere in the world on vacation? I LOVE, LOVE, LOVE going to the beach. I would also like to go back to Vietnam and England. I have always wanted to go to China too :o) I HEART vacations and traveling!!!!! 13. Are you an organized person? By nature, yes. I LOVE organization. However, I am having a hard time keeping up these days! 14. Where would you retire to? Florida...or Vietnam. 16. What are you going to do when you finish this? First I am going to get all of the kids clothes for tomorrow laid out and then watch a few episodes of Seinfeld on DVD...that is how I go to sleep. 17. What is your Birthstone? Not sure what it is called...it's purple. I think it may also be a pearl...can a month have two birthstones? 23. Any news you'd like to share? Not really news, but I can't wait for Dancing with the Stars to begin!! 24. When you were little, what did you want to be when you grew up? An accountant...yep I am a dork. 25. What is your favorite flower? Tulips!!! 26. What is a day on the calendar you are looking forward to? The last week in March...SPRING BREAK!!! I.CANNOT. WAIT!!! 28. If you were a crayon, what color would you be? I am not fond of these types of questions. Too weird. I will never be a crayon. However, pink is my favorite color. 30. Last person you spoke to on the phone? Ronni. She took her foster baby to court today. 32. Favorite restaurant? Loca Luna...although I haven't been there in YEARS! My sweet boy brought me lunch today from Chic-Fil-A and it was sooooo yummy! 35. Summer or winter? No question...summer!!!! 36. Chocolate or vanilla? Chocolate for sure! 37. Coffee or tea? Ummmm, neither. However, if I HAD to drink one it would be tea. I can't stand coffee...yuck! 39. Do you want your friends to comment on this? Sure! I would love to read other people's answers. 41. What is under your bed? A baseball bat...don't mess with me...haha! 42 . What did you do last night? Held babies, read books...pretty exciting! 43. What are you afraid of? I am not fond of flying...however I LOVE to travel internationally so I deal with it. 44. Salty or sweet? Both...together! I love eating french fries with a chocolate milkshake...yum! 46. How many years at your current job? 5 1/2 years as a mommy...best job EVER! 48. What four people will you tag? I am tagging you...yes, YOU! Be sure and leave a comment if you do this so I can read your answers! 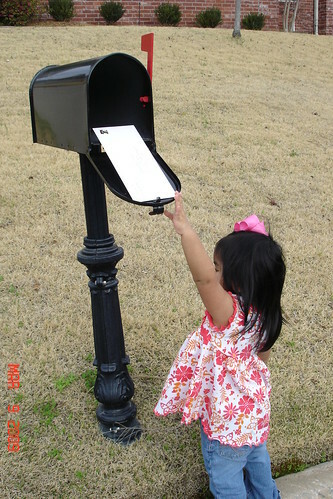 2009 - Sophie Le mailing acceptance papers to our adoption agency for Miss Julianne!